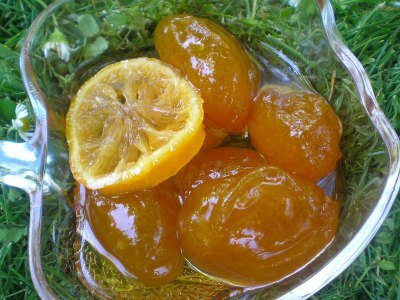 Slatko is made from slightly ripe plums which are peeled and put in lime water. To make lime water solution dissolve 250 g of lime into 2 l of water, stir and pour 2 more liters of water. Leave it for the lime to fall on the bottom then drain the clear solution (lime water) and put plums in the water. Leave them in this solution for at least an hour and then rinse them well and take out the pips. Using a mix of sugar and 1-2 cups of water make a syrup and cook it on low heat until the mixture reaches the consistency of honey. Add vanilla, lemon slices and a spoon of diluted citric acid. Cooked the prepared plums in this syrup for about 25 minutes and then add the rosette leaves. Take off the stove, cover with a lean, moist cloth and once it has completely cooled pour the slatko in jars.